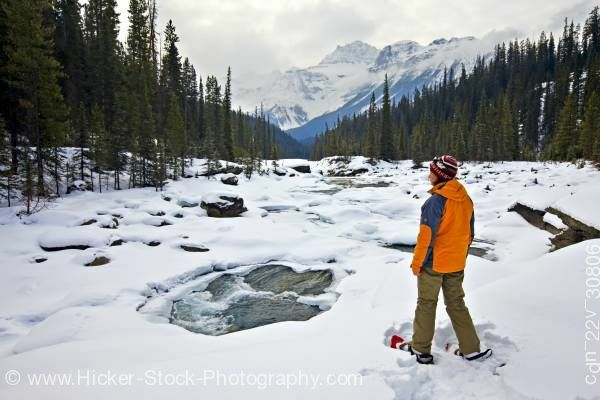 This stock photo includes a woman wearing snow shoes looking at the snow covered winter landscape surrounding the Mistaya River with Mount Sarbach (3155 metres/10351 feet) in the background, Mistaya Canyon, Icefields Parkway, Banff National Park, Canadian Rocky Mountains, Alberta, Canada. Banff National Park forms part of the Canadian Rocky Mountain Parks UNESCO World Heritage Site. Mount Sarbach is located in Banff National Park between Mistaya River and Howse River and is visible from the Icefields Parkway. The mountain is named after Peter Sarbach, a mountain guide from Switzerland, who guided the first ascent.